What's the “there” there? That's what visitors coming to our community want to know. In today's world of tourism promotion, it's no longer enough to just have a lake or two and trust that tourists will come. In order to lure people to a destination, you now have to give them reasons to come – the “there” that's there. What can they expect to see and do? The Cadillac Area Visitors Bureau has done a really nice job of creating events and experiences designed to bring in tourists. Utilizing websites (like cadillacmichigan.com and explorecadillac.org), social media (like Facebook, Twitter and Instagram), added to traditional advertising give potential visitors plenty of “there” options. One facet is the development of self-directed tours. Using these guides, visitors can plot trips to bike, motorcycle, paddle, drive, golf, sight see, boat, ski, fish and more. Every one of these is one more reason for people to come to Cadillac (and patronize local businesses). While the aim is to increase tourism, there is also a benefit for locals. What is “there” for tourists is also “here” for area residents. One of the newest of these experiences is the Cadillac KISStory Tour. This is a walking tour of the KISStorical sites that have become famous since the 1975 KISS visit to Cadillac. Over the past 41 years, I have taken visitors on the KISS tour. One common comment has always been, “Why don't you have markers commemorating these locations?” Specifically, tourers wanted “photo op” spots where they could pose for pictures. The CAVB has now placed four KISStorical plaques around Cadillac. Music fans can now walk from plaque to plaque. Each all-weather marker features classic photos and an explanation of why the spot is significant in the story. Plus, by going to kisscadillac.com, they can bring up audio/video of me telling about some of the highlights that go along with each location. Walking the KISStory Tour also offers an additional bonus – it's another great exercise route in Cadillac. Call it a “KISSercise” experience, if you will. The route is 2.4 miles long and takes in some great Cadillac scenery. Begin at the KISS Monument on Chestnut Street in the southeast corner of Veterans Memorial Stadium. Marker 1 is located just north of the Monument and depicts KISS leaving Cadillac via helicopter. Over the years the football field has been a “must see” for KISS fans. Then walk north and west around Cadillac High School to the gym entrance (athletic director's office entrance at 200 Linden Street). Marker 2 is here and tells about the legendary concert in the gym. From there it's on to downtown Cadillac. Walk around the north side of the gym and past the tennis courts and National guard Building to the Clam River Greenway. Turn right on the Greenway and go past the Sound Garden to Chestnut Street. Turn left and go to the corner of Lake and Pine. Cross over to the Cadillac Chamber of Commerce side, turn left toward Mitchell Street, and when you get to Mitchell turn right and proceed south. Marker 3 is at the old City Hall/Firehouse. This is the site of perhaps the most famous KISS photo from 1975, KISS on a fire truck. The building's architecture has made this a prime photo op for KISS fans. Now go to the corner of East Harris Street and cross Mitchell Street to the other side. Cross Harris (south) and go down to the Sweet Shop where Marker 4 resides. This commemorates the 1975 parade route renaming of Mitchell Street to KISS Boulevard. After seeing all four KISStory plaques, you return to the KISS Monument. To do this, cross Mitchell Street at the corner of Cass Street, walk through the City Park, cross Lake Street at the Rotary Pavilion, and turn right on the McKellop Walkway. Follow the McKellop along Lake Cadillac to the crosswalk at the Soundgarden, cross to the north side of Chestnut Street, turn left and go back to the Monument. 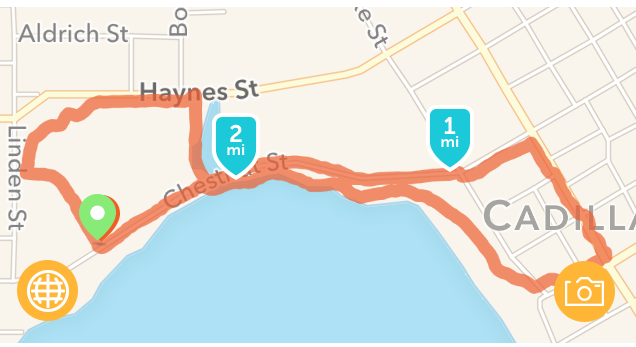 When you complete this 2.4 mile KISSercise, you'll have experienced a major part of Cadillac history, strolled through downtown, and taken in wonderful lake Cadillac scenery. Then you'll know first hand what “there” is there and what “here” is here. To make the Cadillac KISStory Tour even better, the CAVB has a neat “Complete Guide To When Cadillac Was KISSed” brochure featuring classic photos, maps, pictures of the markers, and insider stories. These are free at the CAVB office at the old City Hall building (201 N. Mitchell St.) and have been distributed statewide. For more KISStory information go to kisscadillac.com, cadillacmichigan.com, explorecadillac.org. More cool Cadillac information is being added on a regular basis.